Pte. William Haworth 37608 of the 12th Battalion, Gloucestershire Regiment, was killed in action at Fresnoy near Arras in France on 8 May 1917. He was aged twenty-five and was a single man. He was the elder brother of Pte.Riley Haworth (see page 8) and he also lived at 11 Whittaker Terrace. He was a regular attender at St.Stephens’s Church and Mission Room. 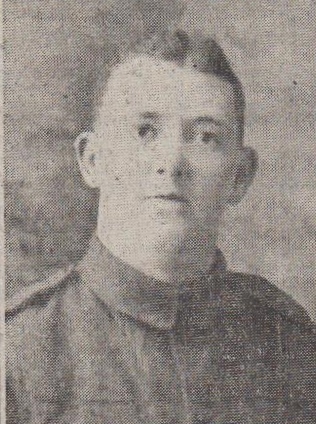 Pte.Haworth first enlisted in the South Lancashire Regiment. He was wounded in 1916 and after hospital treatment he transferred to the Gloucestershire Regiment. On the 4 May the Battalion moved into trenches at Fresnoy which had been captured by Canadian troops the previous day. They were then under shell-fire continuously until the 7 May. The Battalion counter-attacked on 8 May and secured the front line but later had to retire because of heavy machine-gun and artillery fire from high ground on the flanks. Despite repeated requests to the British artillery there was no supporting barrage with the result that the German troops surrounded and were almost annihilated the Battalion. From a total of 483 men involved, 301 were killed, wounded or missing. Pte.Haworth was one posted ‘missing’ and his body never found Pte.Haworth’s name is commemorated on the ‘Arras Memorial to the Missing’. The Memorial is in a suburb of the town, just south of the road to Doullens. It is in the form of a cloister built up on Doric columns. Inside the colonnade 35,395 names are inscribed on stone wall panels. These are men who died in the battles for Arras in 1917 and 1918 and have no known grave. Pte.Haworth’s name is listed with 202 of his comrades. Another fourteen Haslingden men are listed on the Memorial. Official notice has now been received by Mrs. Haworth of Haslingden, that her eldest son, Pte. William Haworth, died on the 8th of May 1917, from which date he has previously been reported as missing. The deceased soldier was 25 years of age, and was a member of St. Stephen's Church and Institute. Mrs Haworth's second son, Pte. Riley Haworth, was killed on October 18th 1916.